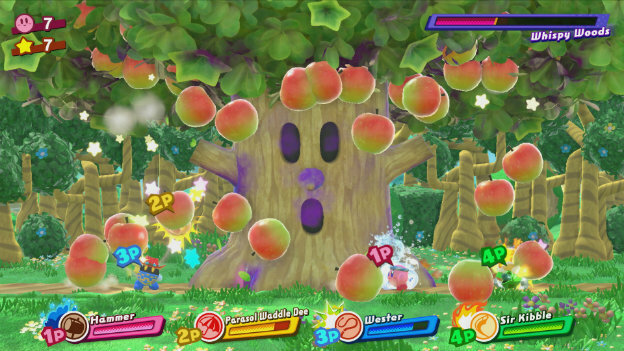 While many of these elements are borrowed or enhanced from previous Kirby games, like Kirby 64: The Crystal Shards, the use of multiplayer in Kirby: Star Allies is its crowning glory. This is a game that is best enjoyed with friends, even though it is quite wonderful on its own. 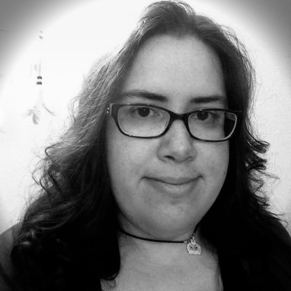 The simplicity in joining and leaving a game is key to its success, since it is as simple as passing a Joy-Con or controller and pressing a button. And its design, which is beautiful, but not too difficult or busy, means it functions well in TV or Tabletop mode with a group. It is even more perfect for people who have younger or beginner gamers on hand, since it is easy for a more experienced player to revive fallen allies, share health, and carry them (both figuratively or literally) through stages. Should someone be alone, I feel like playing Kirby: Star Allies in Handheld mode is the way to go. While some Switch games take notable framerate or resolution hits when they go portable, this is not one of them. It is one that I felt looked and felt as good undocked as it did when docked. It is delightful to play. In fact, I almost felt like it was better in Handheld mode sometimes, because it is easier to pay attention to adorable animations when Kirby is attacking or interacting with his friends. Then, there are the optional modes. Kirby games are known for their sub-games that unlock as you play the game and offer additional opportunities to enjoy minigame experiences. The first two are rather dull multiplayer games. Chop Champs has you chopping trees while avoiding enemies, hopefully knocking down more than the other players. Star Slam Heroes has you saving a planet by using a baseball bat to knock a meteor farther than anyone else. Guest Star ???? Star Allies Go! is a time attack mode with 27 playable characters who aren’t Kirby and are locked into one ability. The Ultimate Choice is an arena mode, where players choose Kirby and his allies, one of eight difficulty levels, and attempt to survive between four and fourteen battles depending on the difficulty. The latter two are the best and most substantial, but all give you a reason to return and hone your skills. It is not the most lavish Switch game, but Kirby looks better than ever. Kirby: Star Allies is incredibly easy to play, with pause menus explaining all attack options and extra players able to immediately hop in. Kirby: Star Allies is one of the best sounding games, with multiple styles. Plus, if you go underwater, the music is muffled! 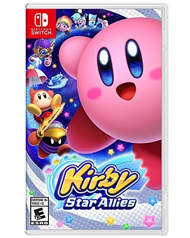 Kirby: Star Allies is not one of the longest Kirby games, but it is a lot of fun and offers two enjoyable sub-games. The newest Kirby title comes to the Nintendo Switch console in HD. Imbue copy abilities with different elements, such as wind, water, fire and electricity, by borrowing or giving them to helpers to add more attack power, unleash powerful attacks, or solve puzzles. Up to 4 players can join in with the horizontal Joy-Con™ controller configuration, or 8 Joy-Con with 4 Joy-Con Grips.